A minor BWV 1041* 12'23"
E Major BWV 1042* 15'31"
D Minor BWV 1052* 20'53"
D Minor for two violins BWV 1043 a 14'40"
Naxos have taken upon themselves the major task of recording all the Orchestral works of J.S.Bach - originals, transcriptions and reconstructions as the cover with this CD in the series tells us. This disc is Vol 2 in the series, and it is devoted to the violin concertos - three for solo violin and the double concerto. Typically of the company, they do a thorough job and the excellent sleeve notes would be a considerable help to the non-specialist buyer. Bach has always been something of an acquired taste to the music-lover whose tastes are more inclined to later music. For years recordings and live performances have often been overweight, stodgy and generally predictable, resulting in a uniform dullness with so much of Bach beginning to sound alike. In recent years performing styles have changed to become leaner and more approachable and this has helped to make his music more immediately interesting and attractive. This Millennium Year is also the 250th anniversary of his death and a lot of new recordings are available. A number have come my way for review and none I have heard need be avoided by the buyer to whom Bach is something of a closed book. 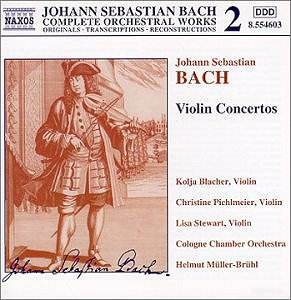 This disc of the Violin Concertos is typical of current Bach recordings. The Cologne Chamber Orchestra is one of Europe's longest established and most highly regarded ensembles. The players use modern instruments to benefit from the larger modern concert halls, but follow historical performance principles. The four Concerti featured are of the conventional three-movement pattern, with a slow central movement framed by two quicker outer ones. The three solo violin concertos have Kolja Blacher (son of composer Boris) as soloist. He has a pure, warm tone and a splendid supple technique that makes these works a delight. The balance throughout is well-nigh perfect and the contrast between soloist and tutti is splendidly judged. Alert, lively were my jottings on listening at the beginning and this would apply as much later as then. Especially attractive were the lovely, meandering solo lines in the slow movements of the A Minor and E major concerti. The D Minor work (recovered from a harpsichord concerto that itself was probably based upon a lost concerto for violin) needs all the listener's attention in its contrapuntal texture, but the concentration is worth it. The Double Concerto has a change of soloists in a prosaic performance of this old favourite. An excellent recording helps this to be a strong recommendation.